LeRoy Banks has no time for love or romance—he’s busy breaking in horses at Whitcomb’s ranch. But on the afternoon of his brother’s wedding, a grizzly attacks the herd of horses, and though Whitcomb’s ranch hands shoot him, the bear lumbers off, injured and enraged. LeRoy, the only competent tracker around, heads out into the Rockies after the bear before it kills again. But not before his ma, a Cheyenne medicine woman, gives him a warning. The mountain holds secrets, she tells him, and LeRoy must not be afraid of what he’ll find. Unsettled by her puzzling words, he sets out, unaware of the dangers he is about to face—not just to his life but to his heart. Geneviève Champlain has spent long, lonely years in isolation in the mountains, her life a trail of broken dreams, loss, and heartache. Her supplies running out, she is teetering on the edge of despair and madness as a snowstorm blows in, signaling an early winter. Her hope is failing—she knows she cannot face another winter alone. Yet she sees no way out. She can never leave her cabin and live a normal life like other women. There is no place for a tainted woman like her in frontier society. Before the storm blows in, she learns the killer grizzly is close by. She has no choice but to head out and try to kill it before it reaches her cabin. Yet when she tracks the bear, she finds something she never expected—something even more threatening than a grizzly. 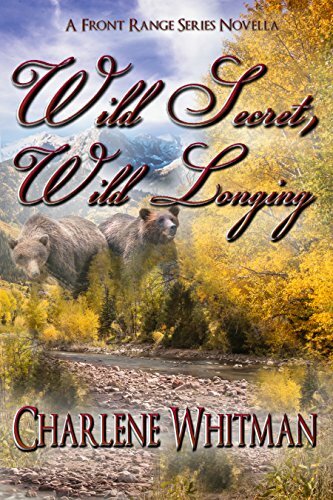 Wild Secret, Wild Longing, a companion novella to Colorado Promise, Colorado Hope, and Colorado Dream takes readers on a heart-wrenching journey into the wilds of the Rocky Mountains. Don’t miss this next installment in The Front Range Series—a powerful, moving story that shows how love conquers all fears—if only you’ll let it. "This was one of those books that I could not put down. Full of twists and turns, yet developing the characters at a steady pace. Clare is an Irish lass who loves horses, riding them and caring for them. She has tracked the wild herd herself, if in a different way than Eli. Eli has been cooped up all winter and has been waiting for the wild herd to reappear. When Eli, Clare and her younger brother come together after a terrifying accident, not to mention a very hungry band of wolves things get really interesting. I would recommend this book to anyone who loves historical fiction and a fast-paced story." "This is the first book I've read from this author and I loved it!! The story was well written and the characters were wonderful. It's a very caring story. I look forward to reading more of Charlene's books." "This is the first book that I've read by Charlene Whitman, but it won't be the last. She did an excellent job of developing the characters and intertwining them for a very cohesive book. It is a sweet, historical book that has facts from the Native American people and those in the area. I enjoyed her description of the terrain and the weather. I'd highly recommend this series to someone wanting a sweet, historical book. I'm looking forward to reading more from this author." "This is the first book that I've read by Charlene Whitman, but it won't be the last. She did an excellent job of developing the characters and intertwining them for a very cohesive book. It is a sweet, historical book that has facts from the Native American people and those in the area. I enjoyed her description of the terrain and the weather. I'd highly recommend this series to someone wanting a sweet, historical book. I'm looking forward to reading more from this author." "Love the book and the whole series. Great Reads! I have two more to go and am so looking forward to reading them." "I have enjoyed every book I've read of Ms Whitmans. I look forward to any and every new addition she adds to her list of great reads." "Fantastic story. Be sure to get the full series to see what happens to each character. You won't be disappointed you did." "I just finished Wild Secret Wild Longing. It is very well written and I couldn't put it down. I can't wait to buy the first two books in the series." "Wild Secret, Wild Longing--what a heartwarming story. Plenty of adventure, challenging occurrences, understanding, warmth and awakening awareness of life in the late 1800's. Could not keep from wanting to find out what would happen next." "Lovely tale of life during very difficult days of our country. You sense the wildness and work it took to survive and live during those times. Thanks to Charlene Whitman for her excellent creative ability to speak the language of the heart." "Charlene Whitman has raised the bar for historical romances to a level which makes her books enjoyable on any number of levels, be it a quick read between chores or a leisurely read to ponder, this read appeals to the insightful, thoughtful audience."